Tata Motors, however, will not be able to meet this small demand and keep the Nano alive from October next year, when safety regulations for existing car models kick in. 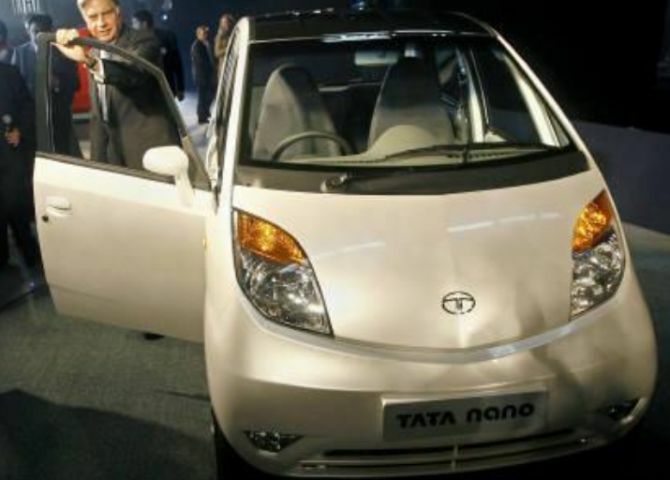 Nano, the ‘People’s Car’ conceived by Ratan Tata over a decade ago and launched in 2009, is as good as dead but it remains in production. A total of 156 Nanos have been produced and sold in the domestic market during the first half of 2018-19.
Who is buying the car, which the masses in most parts of the country have dismissed? Sales in the first half this year are sharply down from 1,436 last year, but have not hit the dead end yet. A few buyers in Kerala and hilly states like Himachal Pradesh and those of the Northeast find value in this car, Mayank Pareek, president of passenger vehicle business at Tata Motors, told Business Standard. “Narrow roads in these regions and the easy manoeuvrability make some buyers stick by the Nano. "If you go to the Kangra Valley, you will see the Nano. We keep feeding our dealers in these markets regularly. But it is definitely not going to Mumbai and Delhi,” he added. The company, which is now thriving on demand for new vehicles like the Tiago and Nexon, has stopped spending on marketing and advertisements of the Nano for the past couple of years. In spite of this, a small demand for the country’s cheapest car still exists. The Nano now begins at an ex-price of Rs 236,000, compared to Rs 253,000 for the Maruti Alto 800, the most sold car in the country. Other vehicles in this entry segment include the Datsun redi-GO (Rs 256,000) and Renault Kwid (Rs 267,000). The Nano clocks the lowest numbers among peers in the entry segment. All existing car models will need to have airbags and meet frontal and side crash test norms. The current structure of the Nano cannot meet these norms without a substantial re-engineering and any intervention to meet these upcoming norms will push up the vehicle’s cost substantially and possibly end whatever small demand the car may have. It was also reported last November that developing an electric Nano was underway through a joint venture between Tata Motors and Coimbatore-based Jayem Automotives. It was reported that this new car would be called Neo. However, there has been no update since then. The Nano, called the world’s cheapest car, did not live up to the expectations in spite of several makeovers. Ratan Tata, former Tata Sons chairman, had promised to sell it for Rs 100,000. Tata later said branding the car the “cheapest” was a mistake. Indeed, it has not remained cheap. Changing features and costs have pushed the price way above that mark and taken away the volumes. The year 2011-12 was the best year for the car when it clocked volumes of over 74,500 units. The numbers, however, declined year after year since then, falling to a mere 1,851 units in 2017-18. This could be the first year of three-digit of Nanos for the car.